The Maharajadhiraj of Burdwan was the biggest Zamindar of Bengal. He had partitioned his zaimindari into smaller mahals (estates) and settled them with petty intermediaries. One of his mahals was almost entirely covered by jungle and was therefore known as the Jungle Mahal. It was however reduced to bushes and shrubs by those intermediaries by overnight felling of trees when the first land reforms law came into effect in the early fifties. Since then soil erosion has become a major problem in the area. With poor soil and undulating terrain agriculture is far from remunerating. Government efforts at afforestation have so far failed to restore the forest to its earlier shape. There is a great concentration of scheduled caste and scheduled tribe people who used to depend partly on free gifts of the forest for their livelihood. With the forests gone they are now mostly landless and land-poor agricultural laborers. Ironically this area inhabited by economically and culturally backward people is flanked on either sides by two economically very prosperous areas of the district. Nature has endowed one with vast deposits of minerals and the other with fertile soil and water resources. For harnessing those resources total investment, both private and public, in industry, mining and agriculture in these two regions has been one of the highest in whole of India. In contrast both nature and man appear to have been niggardly to the jungle and its poor people. Away from the mainstream of the economic and cultural life of the district the jungle must have remained in isolation for centuries. But from the late sixties to the early seventies it regularly featured in not only national but also foreign news media because of the activities of the Naxalites. The inaccessible terrain of the jungle was an ideal hideout for the Naxalites who had taken shelter there after being driven out by the police and the army from various urban centers. To suppress these terrorists a large number of police camps were set up throughout the area and combing operations are conducted by the army at regular intervals. Other positive measures undertaken by the administration to win over the tribals from the Naxalites are improvement of transport and communication by building roads, setting up schools, health centers, small irrigation schemes, afforestation and implementation of land reforms. One winter morning I took with me the Sub-Divisional Land Reforms Officer in whose jurisdiction the jungle falls. We took a road under construction by the Public Works Department which will be the first pucca road connection between the jungle and the main industrial centre of the district. Along the road we found small parties of contractor's laborers working on the read and none of them was a local recruit. At our first stop at a village inside the jungle we met one Mukherjee, a descendant of the local Zamindar family who, though neither a contractor nor an overseer, was supervising the work to ensure that it was properly done. Approximately 30 acres of land in a compact plot lying fallow by the side of the road and owned by the Mukherjees could not be brought under cultivation for want of irrigation. Mukherjee pleaded for sinking a deep tube well so that the plot and its surrounding lands could be cultivated. About an acre of that big plot had vested in the Government. A few huts were constructed there by the Block Development Officer for homeless persons who however demolished them shortly after they were built on the understanding that Govt. would build pucca houses for them. What a contrast indeed! One throws away and the other picks up. Mukherjee is acutely aware of the immense range of satisfaction that modern civilization can offer him and he is clever enough to establish tactful contacts in order to manipulate the channels of economic development towards him and his kinsmen, whereas the homeless persons, most of whom are tribals, demolished the huts which were built for them. This may be conveniently termed as cultural lag between the two sections of the community but I would like to call it cultural determinism i.e. whatever development efforts are made in the area and whatever measures are taken to ensure distributive justice to the underdogs, this cultural determinism will determine the flow and ultimate destination of the fruits of development. We stopped at the next village where two field camps were set up for conducting survey and settlement operations. Here we met the two Kanungos in charge of those camps. While reporting the progress of their work they mentioned a case of eviction of a sharecropper in an adjoining village. I decided to meet the sharecropper. When we reached the house of Heba Muchi we found his wife busy spreading about 8/10 kilogrammes of parboiled paddy for drying in the sun on a small compound in front of her hut. She was wearing a saree - actually a few pieces of cloth of indeterminate color kept together by knots - and her two small undernourished children were sticking to her like lice and whining all the time. Her husband had gone to a market beyond the river for weekly marketing while her eldest son aged about 13/14 years was also absent as he was employed as a mahindar (salaried labor) in a household in the next para (cluster of houses). On our arrival a small crowd had collected which consisted of two or three old women, two men - one being the brother of Heba aged about 28 but looking much older and another Haran Muchi and a few children. The Muchipara where these people live is very small and set apart from the rest of the village. I took my seat on a knee-high earthen wall and started my enquiries. When one of the officers introduced me to the crowd Haran tried lo slip away but I asked him to stay on. Of all the families of muchipara only Haran owns about 20 bighas of land while others are landless. By much persuasion I could make Heba's wife sit near me. When I tried to get the story of Heba's eviction none could give me a comprehensive statement. While all were answering my questions all at a time Haran Muchi kept his mouth shut from the beginning to the end. I then thought it better to talk to Heba's wife alone. I took her hands in my hand in a gesture of assurance but she had no words. Only tears welled up in her pale bewildered eyes. From what she said in reply to my repeated queries and at the urgings of the old women I could gather that Heba had been cultivating for the last few years about 10/12 bighas of land as kishan (a kind of sharecropper) of the landowner Gosain of Bamunpara of the same village. But last year the malik (landowner) became unkind to him which Heba realized for the first time in course of an incident which took place during the weeding operation in the rainy season. When Heba was catching some small fish from the plot cultivated by him but belonging to Gosain the landowner abused and threatened to assault him if he dared to enter on those lands. Terrified Heba left the field and his wife rushed to the house of Gosain with the fish caught by her husband to propitiate the malik. She in her turn was also abused. The next scene of the drama unfolded itself with the incident of forcible harvesting of paddy by the landlord with the help of another of his Kishans and some Bagdis of Bagdipara. According to the Kishani system prevalent in the area the kishan will harvest the crop and it will be threshed in the house of the malik. In this case Heba was not even informed though the harvesting took place before the very eyes of Heba and his neighbors. Heba did not dare to approach the field which is a stone's throw from his house. Realizing that she will have to starve with her small children, Heba's wife gathered enough courage to approach some prominent villagers as well as the Anchal Vice-President who however advised her to be prudent and give up the idea of realizing her husband's due share of the produce. Daroga Saheb: You are Heba, aren't you? Daroga Saheb: Do you have plough and cattle of your own? Deroga Saheb: Then how do you wrongly claim yourself to be a bargadar. You are not a bargadar. Do you know that I can arrest you for this? The interview was short and must have taken at best two or three minutes. But its import and shattering impact on Heba will be lost to one who is not placed in the circumstances of Heba and has no experience of such an ordeal. But the strangest part of the story is that even after this Heba had the tenacity and courage to meet the Camp Officer to report the latest development. When the police officer came to the house of the Anchal Vice President and was wondering how without plough and cattle of his own Heba could be a sharecropper the Camp Officer came forward and showed him the relevant legal provisions. The Police Officer casually handled the Camp Officer's copy of the Act and then left the place without any further comment. Shortly after this the O/C himself also visited the village. Though forcible eviction of a sharecropper is a cognizable offence under the West Bengal Land Reforms Act, in this particular case the landowner peacefully harvested the crops from the remaining plots and Heba did not get a single grain of his share. "That the Kishani system of cultivation has been prevalent in various forms in many parts of West Bengal since long time past is evident from Mr. O' Mally's Gazetteer of the district adjoining ours and the 1932 Survey and Settlement Report of the same district. Curiously enough the Survey & Settlement Report (1927-34) of this district not only does not mention anything about the Kishani system but also describes how, in view of the 1928 amendment to the Bengal Tenancy Act, the names of the bargadars themselves were struck off from the records before their final publication .On a reference made by the ADM of our adjoining district the Board of Revenue had advised him to treat the kishans as bargadars under the Land Reforms Act. Subsequently the then Director of Land Records also made a micro-study of the system as it obtains in that district. This study revealed the basic features of the system as follows- the owner of the land supplies all inputs as advance and the Kisban tills the land on the condition of being remunerated with one-third share of the produce. After the harvest, the net income of the kishan after customary deductions on account of the advances with exorbitant interests (on certain items the rate being as high as 50%) is reduced from nil to even negative making him totally dependent upon and irrevocably attached to his malik. Though this is the basic feature of the system yet it varies from locality to locality. Contiguity of the above mentioned study area to the jungle areas of this district and the I.G. 's experience make it abundantly clear that the system must be prevalent in this area also in some form or other. By the 1972 amendment of the Land Reforms Act tenurial security similar to that of the bargadars has been conferred upon the kishans. Till this amendment the kishans were regarded as laborers according to both legal and local opinions and during the last Settlement Operations, undertaken long before this amendment, they could not be recorded as bargadars. The present Settlement operations will show how many of them are able to get themselves recorded as bargadars. On receipt of the instant orders of the Chief Secretary, I, along with the Settlement Officer visited the field officers of the area and asked them to ensure the recording of all the kishans as bargadars during the coming field season. In fine, one thing needs to be pointed out that the greatest obstacle in the way of recording the kishans as bargadars will come not only from the side of the so-called jotedars but also from the kishans themselves. These must be met by suitable measures against the jotedars if necessary and by making the kishan independent of the jotedar's dadan (advances). But the kishan will in all probability evade identification in order not to displease his malik." I had also received an extract of the S.P. 's report in which he had commented: "Kishan is not a recognized form of tenancy under the law", but recording them as bargadars in his opinion, would considerably satisfy the land-hunger of the adivasi and scheduled caste population of the jungle area. That the S. P. was ignorant about the legal status of the Kishan is palpably clear. To remove this sort of ignorance and confusion I issued a set of instructions to all field officers and appended the following short explanatory note - "Here the JLROs should properly understand the definition of a Bargadar as laid down in section 2(2) of the West Bengal Land Reforms Act, 1955. The real test of a bargadar is his participation in cultivation in any form as well as his sharing of the produce (quite distinct from remuneration in kind of an agricultural laborer). Special attention is drawn to the system of cultivation known as Kishani where the kishan participates in cultivation supplying only his own labor and at the harvest receiving a share of the produce. By the Amending Act of 1972 (Act XII of 1972) the scope of section 2(2) of the West Bengal Land Reforms Act, 1955 has been far widened (with effect from 12-2-71) to include the kishans within the definition of Bargadars. In fact this definition read with section 16(1)(a) and 16(1)(b) of the W. B. L. R. Act, 1955 recognizes as bargardar anybody who cultivates somebody else's land on condition of sharing of the produce. All Field Officers and the JLROs in particular should be vigilant to ensure that all bargadars of this area are recorded during the present revisional settlement operations. For various reasons the bargadars are shy and do not come forward on their own to get themselves recorded as bargardars. Often in many cases some gather enough courage to get their names recorded as bargadar in the field khasra, but before final publication submit, presumably under pressure, Estafanama or "Nadabi Patra". Such cases should be dealt with as per procedure laid down in section 20B of the WBLR Act, 1955. In the jungle areas of this district difficulties of a peculiar kind may be encountered. There the local police should be informed well in advance for necessary co-operation and help". In addition to these I had also circulated a summarized version of a case-study of eviction of bargadars made by the Director of Land Records and a note prepared by me on it pointing out the blunders of different officials, suggesting appropriate actions and need for co-operation amongst the Field Officers of various departments. The last but one paragraph of the note is as follows— "The role of police in the present case is not known. They must have known by this time that the so-called jotedars often harass the bargadars by filing false criminal cases against them. Only discreet enquiries can reveal this. Such cases must be on the increase, especially during the current revisional settlement operations. Whenever any FIR is lodged, the O/C of the P. S. can ascertain whether it is a case in which a jotedar is bringing a false allegation against his bargadar not through local enquiry alone but also by a reference to the latest land record. This is a procedure which has been laid down neither in the Cr. P. C. nor in the Police Regulations. In order to afford help to the weaker sections of the society like the bargadars the police have to go out of their traditional track and work jointly with Land Reforms staff". "Kindly refer to your memo of 6th instant. The role of the police in matters of land dispute and in cases of Bargadars has been clearly laid down by a Government Order, in which it has been stated that in case of dispute between the landowner and his Bargadar, the matter should be immediately referred to the JLRO. The police should take immediate action in accordance with the opinion given by the JLRO i.e., if the JLRO gives his opinion in favor of the cultivator as Bargadar, then he will be given due protection. The police is acting on this instruction of the Government. As regards apprehension of breach of peace due to land dispute or rioting cases arising out of land dispute, police takes the opinion of the JLRO to ascertain the ownership of the land and actual cultivators, and then acts in accordance with law. I think these Government Orders are sufficient for the police for protecting the interests of the Bargadars,"
Government issue orders and circulars similar to those mentioned by the S.P. every year on the eve of harvesting season. The District Magistrate desired me to make a synopsis of all such orders and circulars issued by the Government since 1967 in order to circulate them amongst the field officers including the Officers-in-charge of police stations in a meeting to be held by him. In that meeting the District Magistrate had discussed at length the legal provisions regarding the Bargadars and specially mentioning that forcible eviction of a bargadar is a cognizable offence under the L. R. Act. There is no dearth of laws, rules and directives for us to follow, but understanding the spirit underlying them all apart the fact that how easily we can afford to remain ignorant and ignore the words of law makes me refer to Gunnar Myrdal - "The underdeveloped countries are all, though in varying degrees, 'soft States'. This stands out as a significant feature among other conditions that together make a country underdeveloped. The 'soft state' is understood to comprise all the various types of social indiscipline which manifest themselves by : deficiencies in legislation and in particular law observance and enforcement, a widespread disobedience by public officials on various levels to rules and directives handed down to them, and , often their collusion with powerful persons and groups of persons whose conduct they should regulate. Within the concept of the "soft state" belongs also corruption * * * * These several patterns of behavior are interrelated in the sense that they permit or even provoke each other in circular causation having cumulative effects." Hailing from the same urban background the two young officers have been engaged in the same arduous job of Settlement Kanungoes of the two adjoining camp offices in the depth of the jungle. They have become very friendly and whenever possible they spend their off time together. One day around 7 p.m. when they were thus strolling together along a village road they were chased by a group of people, one of whom they could identify. The same evening one Haripada abused the Camp Officers and threatened them to assault with chappals (slippers) in presence of many villagers because they had recorded bargadars in his land. Complaint was lodged with the local P. S. and the police came for investigation next day and according to the Camp Officers, got corroborative evidence from at least two eye witnesses. The result of the investigation is not known but nothing has happened so far to Haripada who is openly abusing the Camp Officers. These officers appeared to be very apprehensive. Had they remained unemployed who knows whether they, like so many frustrated youths of this generation, might not have swelled the ranks of the lawless Naxalites and roamed the forest fastness of the Jungles? Instead they are now the part and parcel of the law enforcing machinery. But still they find themselves unwanted like the Naxalites. Today or tomorrow the Settlement Operations in the Jungle will be over and these officers will leave the place. But what is in store for the Muchis? Will the land-owners put up with their audacity? After the Kanungoes are gone, how will they settle their accounts with the Muchis?- by bringing false cases, both civil and criminal, against them? or by some other direct methods? Will anybody stand in such perils by their side? Again, I would request you to read my blog - Bankimchandra and the peasants of Bengal. Dr. Mallick, Thanks for reading and commenting. For ages the poor have been exploited, our so-called civilization is built upon their blood and bones. Have you noticed what has happened in Singur and Nandigram in West Bengal? 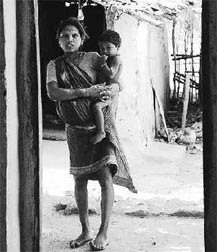 The atrocities perpetrated on the poor villagers by the leftist government is unprecedented. It is horrible, Hitler's genocide pales into insignificance. I was under the impression that Bengal is better than other states in India in implementing the Govt orders in favour of poor people. Injustice has bigger wings than we imagine. Thanks for throwing lights on the plight of the poor people. But does any govt have ears?